This blog is about our studio experience this summer taking “The 100 Etude Challenge”. As we approached the summer of 2016, I knew we had several students who needed to focus on their fundamentals and feel their technique solidify. We do scales and etudes every lesson and I believe this is how things should be done. Sometimes with competition season I feel parental pressure to focus on a performance piece or the need to rehearse with piano and we lose our way temporarily. Before too long, we always head back to Flesch, Hrimaly, Wohlfarht , Kreutzer, and Rode. This is where our skills are built and where our technical fluency begins. In every major work for violin there will be runs that are in the form of a scale or arpeggio, broken thirds, chromatic lines – sometimes all of the above! Composers will take their melodies and add double-stops to make it richer, more passionate, or just to embellish. Without scale work and etudes, our hands stiffen just as we should embrace these embellishments or virtuosic passagework. So I took a leap right before summer break began and issued out a 100 etude challenge to my studio. The prize? A trip of fun to an amusement park to celebrate their newfound progress. Cue shocked looks and wide eyed students! I started with just the teenagers stating that if they reached 100 on their own they could earn a trip just for them. They have a fairly tight peer group so this idea appealed to them very much. If that goal wasn’t met by August, there were told we would invite the little ones in to contribute. Initially everyone seemed on board. Quickly, some students questioned our ability to reach 100. I encouraged them playfully to spend their time practicing instead of figuring out how many etudes each of them needed to pass per week. It was surprising to see the different reactions in the students and I learned more about them in the face of a challenge. Some had great blind faith and leapt into work. Others doubted we could get there but participated nonetheless stoicly. Some left half way through. I allowed them to send me videos during the week or when they were on vacation to pass etudes to get us ahead. I emailed back comments when I needed them to work harder and made a point of only passing them when they were truly finished and representative of their best work. As we approached August it became clear that although we were almost 2/3 of the way there we needed to call in the rest of the studio to help us reach our goal. The little people in the studio were thrilled. They knew they might be called on and were asking at every lesson, waiting in the wings to kick into high gear. I allowed them to use their etudes retroactive to the date the older ones started so we tallied up happily. We were more than ¾ of the way there now! The younger students love the etudes and this always surprises people. By and large, they really enjoy working on them and some of my students tackle more than one at a time without my prompting. It took me years to come up with why in the world this would be true (it surprised me too!) but I have a pretty strong theory now. I think the elementary school crowd likes etudes because they run more in line with their child development as well as their schooling. Etudes are full of patterns both rhythmically and harmonically and there is symmetry everywhere. They seem to approach them almost like a game. The kids who like them are great at rubix cubes, crosswords, and mazes. 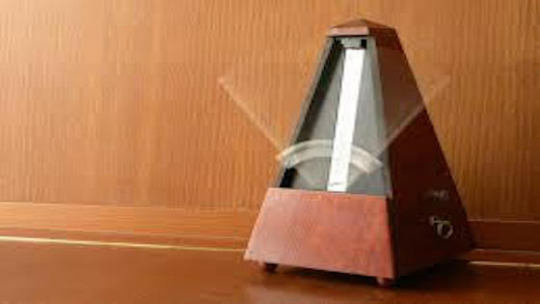 They also get to use the metronome and regulate their body and feel it coordinate in different ways. It is stimulating them in all the right ways. Some of my friends who are teaching colleagues approach me about my teaching of etudes so early and seem to think I am torturing the poor kids. When they chide me about it, I tell them with a wink that they shouldn’t project their feelings about etudes on the kids. The kids take their cues from us. If I didn’t teach beginning violin in a way which is (at least at first) child led, I wouldn’t have even picked up on the fact that they liked it. I would have introduced the etude book as, “Here is the book of drudgery we have to somehow make time for in our lessons together. “ My own daughter is 6 and her favorite part of practice is her scales where she gets to invent a rhythm and template it up and down. It changes every day and she likes to surprise me. I give her extra kudos if she can add a bow distribution to it. She also loves what she calls “Melodious Double Slops” where she sounds like two people at once. She now has her very own metronome where we learn how to stay steady in the Wohlfarht Etude Book 1. So with the whole studio (that’s 20 students) in full force, we reached our goal to 100. It was an amazing moment and the lead up in the last weeks was so exciting. They have made such strides and the difference in their work ethic is palpable. The little ones were our heroes and this lifted them up in a beautiful way that made the achievement even sweeter. One thing I have learned is you cant force a student to do fundamental work and you cant force a parent to value it. In the past, my assignments have been glossed over, undervalued, ignored, and cast aside. I have even been told by parents they could just handle that part on their own! (Darn those pesky etudes and scales!) Every student I encountered here over the summer who was a return student of mine on summer break from music school reported they don’t do scales or etudes in their school during the year. They say they don’t have time in their lessons either. I feel there is always ten minutes. Sometimes that is enough to hear the beginning of an exercise or a scale and introduce a new concept about balance or breathing to apply during the week. I understand there might be periods of time where your fundamental work is limited but you still have to be committed to getting back to it. As a teacher I know it is my role to encourage, support, and create opportunities to motivate the whole studio so I do my part. By taking their development as young people into the equation, I am able to keep them interested and happy to work. The rest is up to them! Happy workers in practice are great violinists and musicians. Once a kid is happy to put good thoughtful work into play, (see what I did there?) the sky is the limit. One thing is for sure. There isn’t just a day at the park in their futures. There is cleaner, more empowered playing coming this year for them thanks to the summer they spent on this challenge. I wonder what next summer will bring? Edited to add: Since the blog appears to have been archived - I am answering a question I received in comments. We counted every etude passed in the studio and the 100 etudes were reached accumulatively. We also counted Melodious Double Stops as etudes. We didnt publicize within the studio who passed how many but just the total number as it increased. So every time the kids walked in, they wanted to know what our number was! Thanks for this question and I hope it clears it up! September 15, 2016 at 05:34 AM · Amy, I enjoyed your writing and description of how your students took up the challenge very much. It sounds like the parents could also take a lesson from you on how discipline leads to mastery. One thing I'm not clear on is how the 100 etudes were applied. I would have assumed that the students individually had to learn 100 etudes. Can you please clarify?